The Environmental Protection Agency's online Aerometric Information Retrieval System (AIRS) hit the Web last fall, but only recently have EPA officials begun to promote their colorful AIRS Graphics on the Web (AGWeb) application. A map generated by AIRS Graphics shows carbon monoxide emissions in Orange County, Calif. The app also makes charts displaying pollutants such as ozone and sulfur dioxide. AGWeb retrieves database information to dynamically generate maps and charts of regional pollution levels in response to user queries. A year ago, Tom Link, senior manager for advanced data delivery systems in EPA's Office of Air and Radiation, was in the thick of preparing the mainframe AIRS Graphics system for its Web transition [GCN, May 3, 1999, Page 30]. Now Link and his programmers are planning to add more sophisticated features. AIRS, the world's largest repository of air pollution information, holds billions of records going as far back as 1956 for some regions of California. The original AIRS database was a green-screen system that started in 1970 when EPA was a new agency, Link said. In 1993, graphical functions were added to produce AIRS Graphics, because 'one picture is equivalent to a thousand pages of printout,' Link said. The AIRS Graphics mainframe version was available only to 900 users with passwords, Link said. EPA's Office of Air Quality Standards Research in Research Triangle Park, N.C., charged users $1,200 per hour for access. Some paid hundreds or thousands of dollars for further analysis of their AIRS data. 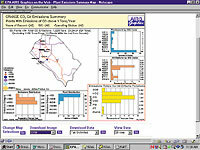 The mainframe version of AIRS Graphics was developed with software tools from SAS Institute Inc. of Cary, N.C. Using SAS software for the Web version let the developers leverage as much as 70 percent of the original code. 'Not having to retool the code was a big plus,' Link said. EPA officials also wanted a Web application that wouldn't require users to have experience with geographic information systems. The agency's team used SAS/IntrNet, SAS/Graph and other tools to pull data from the AIRS Oracle8 database and render maps on the fly. The application resides on EPA's public-access server, a Compaq AlphaServer 8400 with six 625-MHz Alpha processors running Tru64 Unix 4.0D. It has 6.1G of RAM and 642G of disk storage. AGWeb's home page gives users several initial choices. They can request maps showing point sources of pollutant emissions, locations of air monitoring sites or a combination of the two. They can look up total pollutant emissions by county and find counties that don't meet EPA's air quality standards. In designing the site, Link's team drew storyboards, just as film directors do, to figure out the navigation paths users might take depending on their needs. 'It looks easy because you're not seeing the hundreds of lines of code running in the background,' Link said. The application collects temporary cookies to retain users' choices as they click back and forth between pages. The cookies expire once the users leave AGWeb. Not only does AGWeb save users money, it also saves thousands of hours of staff time formerly spent processing information requests, Link said. EPA does not count page hits, but the AGWeb site, at www.epa.gov/agweb, can handle up to 200 simultaneous users. So far, AGWeb has been generating several hundred maps a day, Link said. He and his team use AppDev Studio, a SAS suite of Web development tools, to write Java applets for future use on AGWeb. The next version, now under construction, will let visitors click on a map and zoom in to see details. The site currently does not allow zooming. Depending on the geographical area and the parameters chosen, map details appear small and hard to read on a typical monitor. Although the zoom function sounds like old technology to users of commercial mapping sites, Link said, zooming is different for AGWeb's dynamically generated maps. 'It's harder to zoom in on a dynamic image than on a static .gif image,' Link said. Commercial sites produce a map of finite size and resolution and give the user different views of it, 'kind of like using a magnifying glass on a huge painting,' he said. For AGWeb, Link envisions a dynamic zoom function that increases map resolution and adds details as the user zooms in. Future users will also be able to click on pollutant sources shown on AGWeb maps and drill down to get the names of the polluters and other details. 'We're adding depth and breadth and scope as we go along,' Link said.